Scientists are studying fire ecology in the Valles Caldera to determine the impacts and the relationship between fire and the living (biotic) and physical components (abiotic) of the environment. Fortunately, scientists had already begun their ecological studies of the Valles Caldera and were able to compare the data from before and after the Las Conchas Fire. The burning question for Fire Ecology is: Which species are able to adapt to the impacts of fire? In this unit under Labs and Activities, you'll find a student lab sheet for students designed to help students interpret the research on fish kill. Use the TeachData Portal to link to other EPSCoR data resources. Follow the link to the SAMs lesson to learn about the importance of biomass in aquatic environments. Colleen Caldwell and Matt Ziegler wade through the Los Indios stream after a heavy monsoon rain following the Los Conchas Fire, 2011. 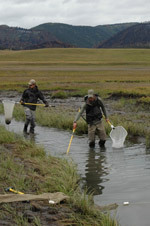 They are studying native and nonnative fish interactions and the changes that take place after a wildland fire. Colleen Caldwell works for the New Mexico Cooperative Fish and Wildlife and Conservation Ecology Research Unit at New Mexico State University. She has a PhD from the University of Tennessee and is interested in the impacts of disease, over grazing and drought and its associated with climate change. Matt Ziegler is working at New Mexico State University as a Research Specialist. He graduated with a BS in Biology: Fisheries from Mansfield University in Pennsylvania. Both Colleen and Matt are interested in how climate change impacts fish ecology.